This post is sponsored by FAGE, but all thoughts and opinions here are my own. I don’t know about you, but I’m a snacker. Whether I’m working at home (more like ESPECIALLY if I’m working at home!) or if I’m in an office for a client, I always try to have healthy snack options on hand. For me, snacking can be a grab-and-go option, like a little bag of almonds or dried fruit. Sometimes it can be a little more luxurious and decadent (while still being healthy). FAGE Total Split Cups yogurt is a sweeter something I reach for. 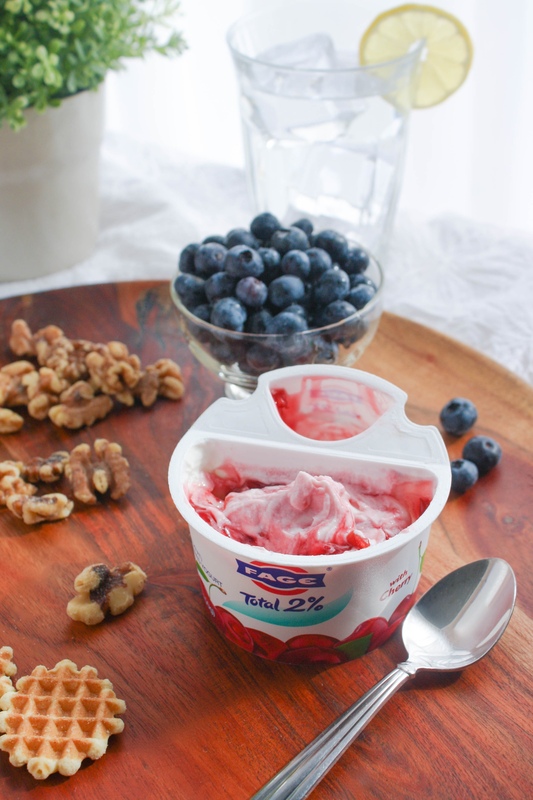 FAGE Total Split Cups are made from all-natural Greek strained yogurt and include fruit toppings to mix in. I love that there are different options available when it comes to fat content. 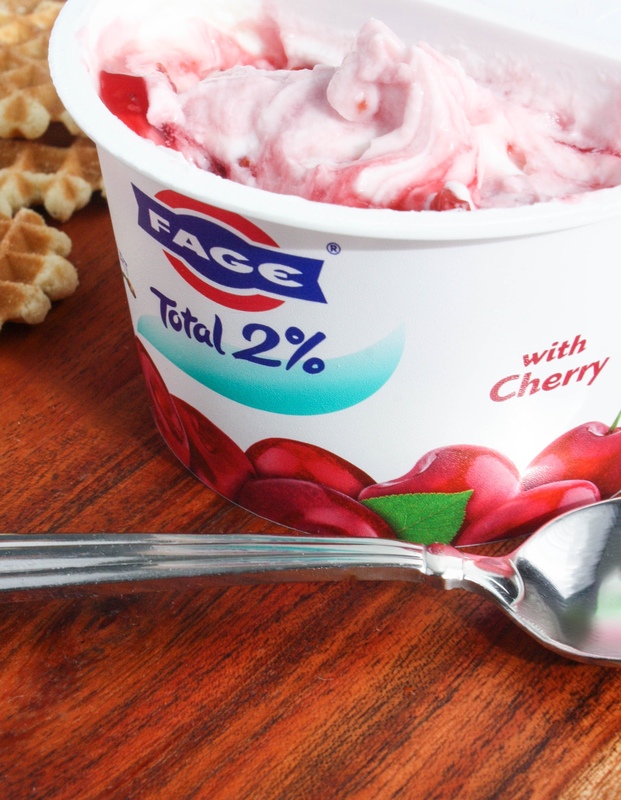 I like the FAGE Total 2% variety, and of course all the available fruit flavors, too! Cherry is my favorite and measures in at 120 calories for a serving. The Split Cups are also great for breakfast because they pack a protein punch to keep you going (there is more protein than sugar in the 2% varieties — 12 grams). I love them for snacks…and for dessert, too! Not only are these cups protein rich, but they’re rich and creamy, too. 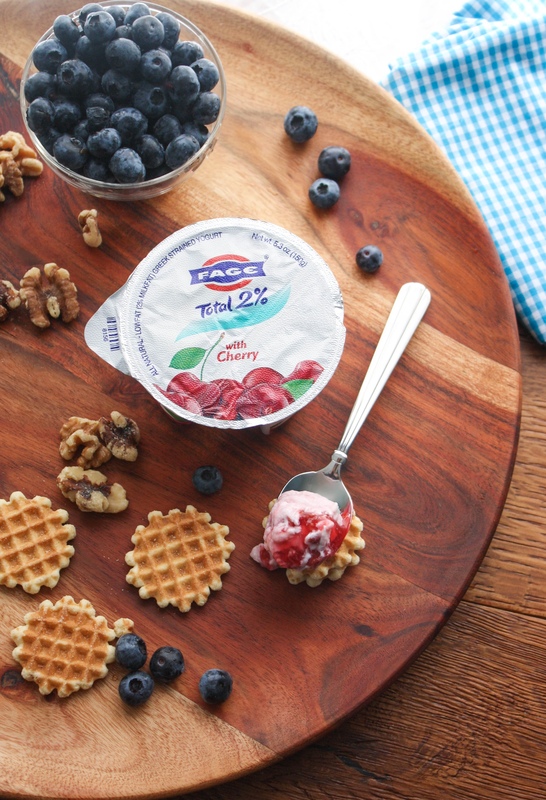 If you’re in an office with a fridge, FAGE Total Split Cups are perfect to take along as a mid-day snack. You can pack them in your kids’ lunch bags, or indulge in them after your afternoon workout. They’re perfect to help you maintain your healthy lifestyle goals. 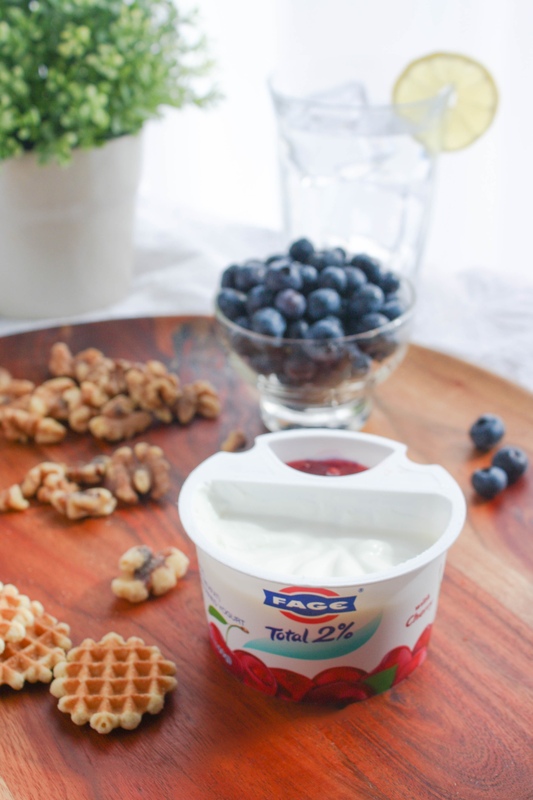 I hope you’ll check out the FAGE Total Split Cups yogurt in your favorite fruit option. Find a store near you that carries them. I love to make snack options myself, too, because I tend to get a bit of the grab-and-go burnout, even when I’m not going anywhere. It’s not difficult to make healthy snacks on your own, and it doesn’t have to be time consuming. 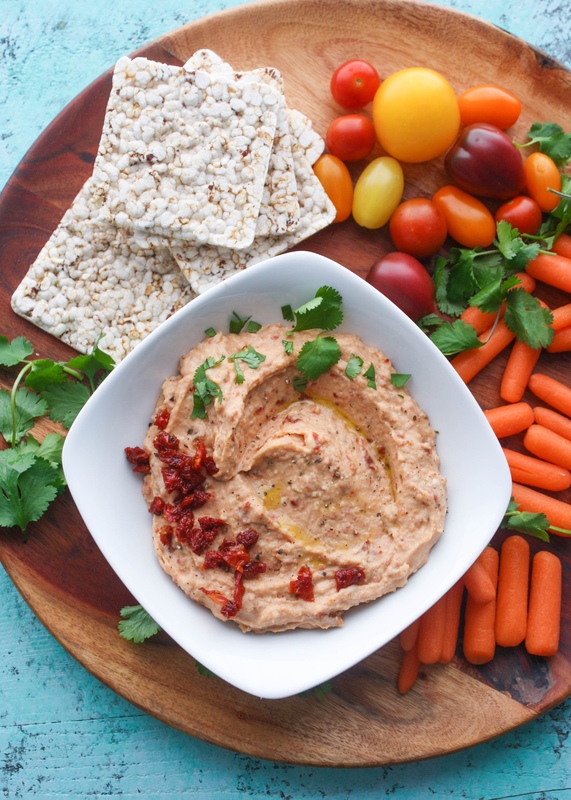 Enter roasted garlic and sun-dried tomato hummus! This hummus is a tasty and easy-to-make snack option. It’s perfect to keep your options flavorful and healthy. Hummus is one of my favorite savory snack options, whether it’s during the day, or something that I put out when people are over. The combination of roasted garlic (don’t worry — roasting the garlic mellows out the flavor) and sun-dried tomatoes in this recipe is divine. 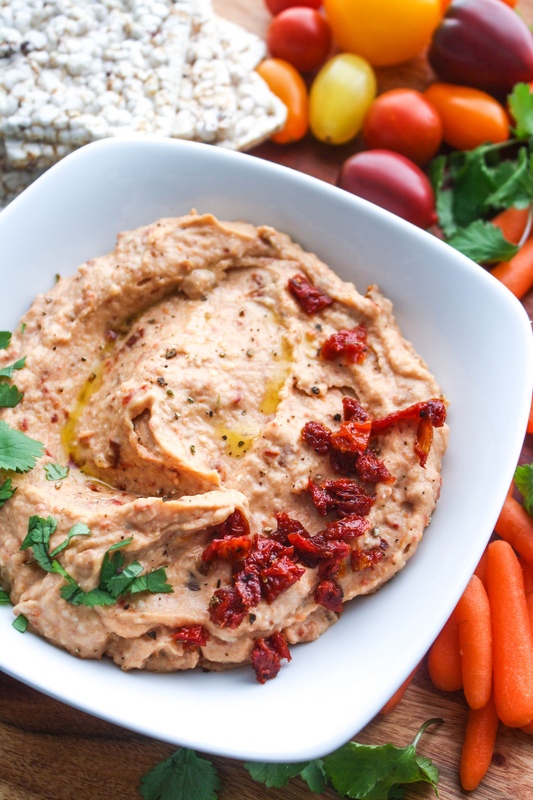 This hummus includes white cannellini beans, a whole head of roasted garlic (YUM! ), sun-dried tomatoes, lemon juice, and some other seasonings to tie it all together. Easy-peasy. No fuss, no muss. Dig in with some rice cakes or veggies for a wonderful snack that doesn’t take long to make, and that adds another snacking option to your week. Let me know if you prefer something savory or sweet when it comes to snack time. Will you reach for a sweet but healthy FAGE Total Split Cup or whip up your own batch of hummus? When you’re ready for hummus, try this recipe for an easy and tasty option. Preheat the oven to 400 degrees F. Slice off the very top of a head of garlic (keep the peel on) and drizzle it with a little olive oil. Wrap it in aluminum foil. Bake for about 40 minutes or until the garlic is soft. When done, carefully unwrap it, and squeeze out the cloves. Place the cloves in a food processor along with the beans, olive oil, lemon juice, Parmesan cheese, sun-dried tomatoes, salt, black pepper, and red pepper. Blend until smooth. Taste and adjust the seasoning as needed. Garnish with parsley and a drizzle of olive oil, and serve along with your favorite crackers and vegetables. I will have to make this hummus!! Love the recipe the flavor combos sound outstanding!! I am a big snacker too, I know it is not good to skip meals but I literally just snack all day between breakfast and dinner because I am typically working through my lunch! Can't wait to try the yogurt and this hummus!! Thank you so much!! Thanks very much, Leah! I go snack crazy sometimes (and not always in a good way). Both of these options help, for sure! Ohhh this hummus sounds SO good! 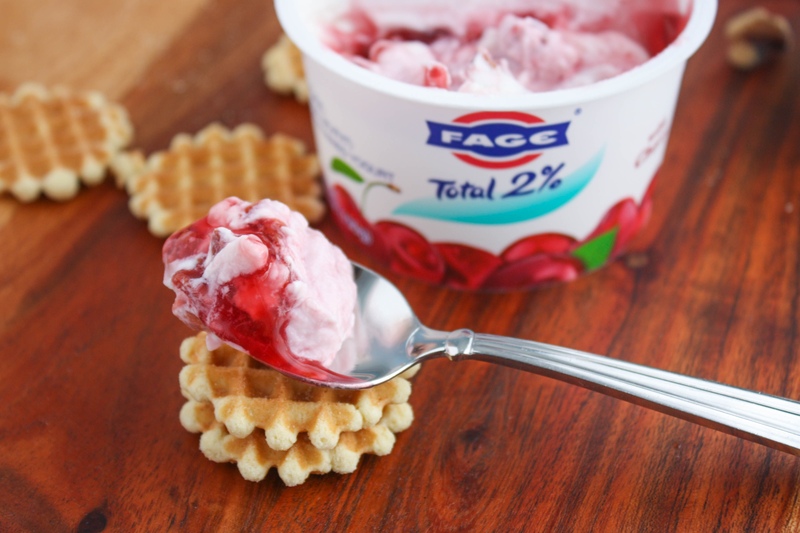 And I have to find those cups - LOVE Fage! Thanks a bunch, Taylor! The cups are soooo good, too! The hummus looks SO delish. I have it pinned so that I can try and make it soon!! Thanks a bunch, Kristen! I hope you try it soon, and enjoy! Hi Indya! I hope you give this recipe a try - if you like sun-dried tomatoes, I'm sure you'll love this! Thanks so much! These snack options are right up my alley! I'm a big yogurt fan, so I'll definitely have to look for these Fage split cups. I also love making all kinds of Hummus, and this recipe sounds delicious! Thanks, Cait! The Split Cups are so tasty (very creamy)! I hope you try the hummus, too! Both options would make an awesome snack! For sure! Thanks for stopping by, Cathy! My husband would LOVE this hummus! Can't wait to try it! Thanks, Allyson! I hope you make it, and enjoy! These are great snack options and I'd happily eat both of them! :) That hummus has such a gorgeous colour! Thanks very much, Rebecca! I hope you give it a try and enjoy! Thanks, Erin! I hope you give this one a go! I love hummus! I always keep it classic. But I also love sun-dried tomatoes. Never thought of actually combining them. I will definitely give this a try! Thanks, Cristina! I hope you try it -- this is super flavorful, for sure! Love these two options for a healthy meal. OMG! I have to make this hummus! It looks absolutely amazing! Thanks! I hope you try it -- very yummy, if I say so! this hummus recipe is AMAZING!! Thanks a bunch, Felicia! Hope you try it! I am definitely a snacker, especially during the day, so this looks perfect to me! I'm right there with you, Dee! Thanks so much! This looks super yummy, I love tasted garlic hummus but have never contemplated trying to make my own. Pinned this one for my must try list! Thanks, Yvette! I hope you try this recipe -- it's really easy to make (and more cost effective than buying it prepared)! I am always looking for a good snack option! Yummy! This recipe looks wonderful. I want to try it. Thanks, Rebecca! Hope you do -- it's super tasty and easy to make, too! Hummus is one of my fave snacks! It can be very healthy and a great way to sneak in veggies to my diet. Absolutely! Thanks so much, Holly! I love Fage! Great post! I'm always looking for healthy snacks, and these look beautiful and wholesome. I definitely have to try them out. Thanks so much, Mila! I hope you try each and enjoy!